Statue of God Chao Kung Ming, China, 18th C.
Please refer to our stock # 1-0800 when inquiring. 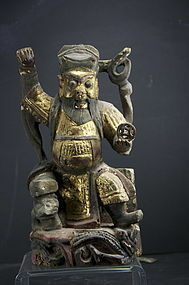 Statue of God Chao Kung Ming, the Military Wealth God, dressed in military garb, half sitting on a throne, his left hand holding a coin, his left foot tramping the head of a dragon, his right leg resting on a lion. Votive box open at the back and still containing a paper. Lacquered and painted wood in gold and polychrome colors. China, 18th century. Height: 8 3/4" (22,2 cm). Old insect infestation (no danger), otherwise very good condition. Statue of Chao Kung Ming, China, 19th C. Statue of Chao Kung Ming, God of Wealth, China, 19th C. Statue of God Hung Hsien Tati, China, 19th C.